CANCUN, Mexico, December 1, 2010 (ENS) – Japan rocked the UN climate talks in Cancun Monday with the declaration that the Japanese government would not agree to extend the Kyoto Protocol beyond 2012. Jun Arima, an official with Japan’s Economics Trade and Industry Department, said that his country would not inscribe its greenhouse gas emissions target under the Kyoto Protocol on any conditions or under any circumstances. “Even if the Kyoto Protocol’s extension becomes a major item on the agenda at Cancun and Japan finds itself isolated over it, Japan will not agree to it,” said Hideki Minamikawa, vice minister for global environmental affairs at the Environment Ministry. Japan’s move surprised many delegations although Prime Minister Naoto Kan, said as early as October that he was opposed to simply extending the Kyoto Protocol beyond its expiry date of 2012 if a replacement agreement is not reached in time. Japan has taken this position even though the country is legally bound to limit its greenhouse gas emissions under the protocol, which was initially adopted in December 1997 in the Japanese city of Kyoto and entered into force on February 16, 2005. As of July 2010, 191 nations had ratified the protocol, which commits 37 industrialized countries to limit their emissions to an average of 5.2 percent above 1990 levels. But the two countries with the highest emissions rates – China and the United States – are not bound by the protocol. “The biggest problem is that an agreement has not been reached on a framework in which all major emitters will participate,” Minamikawa told the Japanese news agency Kyodo. 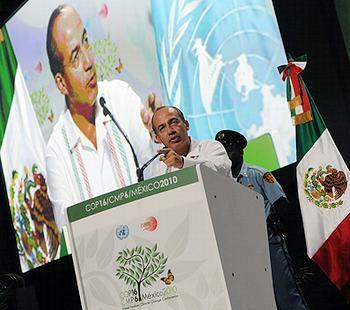 In Cancun, the 16th Conference of Parties to the United Nations Framework Convention on Climate Change, UNFCCC, opened Monday and will continue through December 10 with representatives of 194 governments and hundreds of civil society groups in attendance. Negotiators are attempting to agree on a treaty to limit the greenhouse gas emissions reponsible for global warming that will take effect when the Kyoto Protocol’s first commitment period expires at the end of 2012. At last year’s UN climate talks in Copenhagen, many major emitting countries agreed to take voluntary, rather than legally-binding actions to limit greenhouse gas emissions by approving the Copenhagen Accord. But many developing countries are clinging to the Kyoto Protocol, saying there will be no progress on long-term cooperative climate action without concrete progress on extending the Kyoto Protocol. 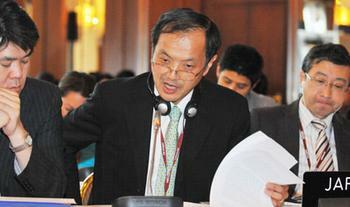 Environmental groups are appalled at Japan’s position, which they warn could derail the negotiations. The climate conference opened on Monday with a speech from Mexican President Felipe Calderon, who cited last year’?s hurricane in Mexico, this year’?s floods in Pakistan and fires in Russia as examples of increasing incidences of natural disasters brought about by climate change and already affecting the world’s poorest and most vulnerable people. Espinosa believes negotiators in Cancun can reach a deal to launch action on adaptation, technology transfer and forests and can create a new fund for long-term climate finance. 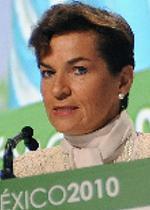 UNFCCC Executive Secretary Christiana Figueres said in her opening address that governments had revealed a growing convergence that a balanced set of decisions under both the Convention and the Kyoto Protocol could be an achievable outcome in Cancun. She called continuation of the Kyoto Protocol a “politically charged issue” and said the world needs to avoid “a gap” after the first commitment period expires at the end of 2012. Figueres said that during the past year, developed countries had shown a commitment to live up to the fast start fund of $100 billion pledged in Copenhagen to help developing countries cope with the unavoidable impacts of climate change. She said developed countries have announced pledges totaling US$28 billion and many of them are now making information available on the disbursement of these funds. U.S. negotiator Jonathan Pershing, the State Department’s deputy special envoy for climate change, said the United States is committed to the Copenhagen Accord. By contrast, China, the world’s largest greenhouse gas emitter, will continue to “stick to the UN Framework Convention on Climate Change, the Kyoto Protocol and the Bali Roadmap,” the chief Chinese negotiator said in Cancun Monday.